Word Document Repair 11.01.01 - Download Win Apps. 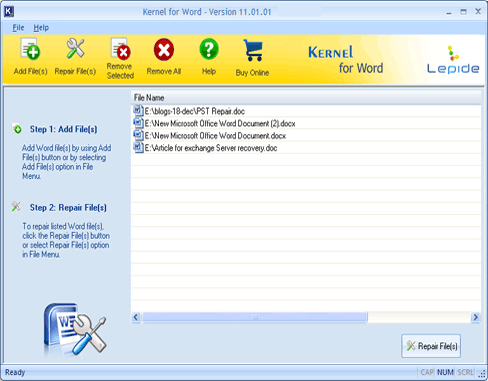 Word File Recovery software for corrupt documents of MS Word..
Kernel for Word is efficient doc file repair software for repairing MS Word documents and recover data from them. Data recovery from MS Word files have become easy with Kernel for Word software where successful and accurate recovery is assured. Kernel for Word is simple, secure and reliable software to it and is helpful for individuals, professionals or any other user who have lost their important data stored in. doc files due to. doc file corruption.